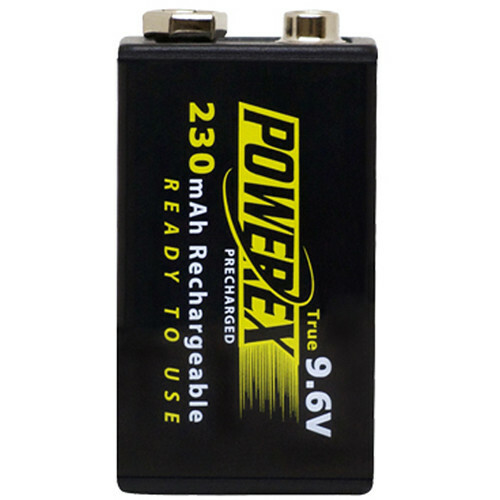 Power various electronic devices with this ready-to-use 9V Precharged Rechargeable NiMH Battery from Powerex. It is capable of outperforming a standard 9V battery because it features a slightly higher 9.6V of output power. Thanks to its very low self-discharge rate, the unit will retain up to 85% of its 230mAh capacity after 1 year in storage. Additionally, it can be recharged hundreds of times. The NiMH cell is compatible with Powerex's MH-C1090F 10-Bank Charger and MH-C490F Stealth Charger. Box Dimensions (LxWxH) 3.5 x 2.7 x 0.6"
9V Precharged Rechargeable NiMH Battery (9.6V, 230mAh) is rated 3.6 out of 5 by 5. Rated 2 out of 5 by Till U. from Cannot use safely because the initial voltage is too high I bought two of these batteries because according to the manufacturers discharge performance graphs, the 9.6V version was going to perform better than the 8.4V version. I did not consider, however, what the voltage would be after a fresh charge. Out of the box, the batteries provided 10.4V. Immediately after charging fully, the output voltage reached 11.5V. A couple of days later it dropped to 11.0V. I intended to use these batteries in a digital multimeter. As it turns out, the internal circuitry of my multimeter can be damaged by a battery that provides more than 10V of output voltage. If you are buying these, make sure with the manufacturer of your device that it can safely handle battery voltage of up to 11.5V. Rated 1 out of 5 by Edward (Ted) from After some use... I don't recommend these batteries for the Rode Video Mic Pro. They power down very quickly. I have found that ipowerus 9V-700mAh work much better and recommend you check those out on B&H's site. They cost more money, but you get what you pay for. Rated 5 out of 5 by Edward (Ted) from High Energy These are an excellent addition to our production bags. Together with the Watson Universal 8 Bay Charger, we are powered up and ready to go for any shoot. Rated 5 out of 5 by Bill from So far so good They work well so far. Only used them twice to power my mics. Seem to last as long as I need them to. Then recharge and do it again. Rated 5 out of 5 by Will from Great I find they hold a longer charge than other rechargeable.